It looks very intimidating, let’s just start with that. What you ask? Well, the massive red hulk of a motorcycle here, of course, what else! 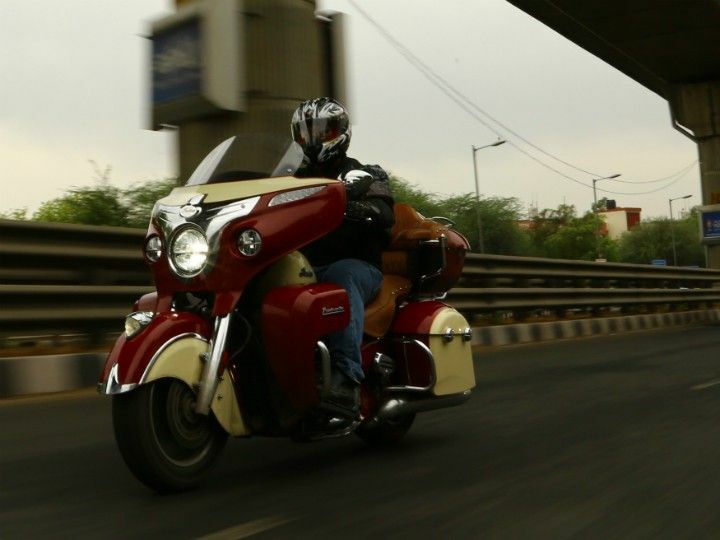 It goes by the name of Indian Roadmaster and happens to be the latest and the biggest Indian motorcycle to date (also, probably the heaviest). Just a look at this behemoth is enough to send a shiver of intimidation down your spine. At almost nine feet long, over a metre wide and weighing in at 421kg dry, the Roadmaster is not to be taken lightly (pun not intended! ), or so you would think. But despite its massive size it looks rather approachable, and of course exquisite. It is what Americans like to call a full dresser, just like the Harley-Davidson Electra Glide. The Roadmaster is based on the Chieftain which means you get the massive front fairing with a headlamp that complements the size of the motorcycle perfectly, just like the Chieftain. The one we got was finished in a scarlet and off-white hue, the true Indian colours, and that scheme makes it simply astonishing to look at. Aesthetically, it is the perfect embodiment of the Chiefs from the fifties if they were built for 2016. The front fender almost covers the whole front wheel and tapers off at the end in true retro Indian style. Oh and did we mention the illuminated war bonnet on the front fender? The design flows flawlessly thanks to the flowing design of the tank and the hard panniers on either side which mimic the design of the rear fender and taper off along with it. And then there’s the attention to detail. The engine looks like it took about three cans of chrome to paint and still doesn’t look overdone. The grips have grooves in them so your gloved hands don’t slip, the wide rider’s seat and the armchair-esque pillion perch are all finished in leather. Goes without saying, fit-finish levels are impeccable and the bike feels well-built and solid. Also, the Indian logo is everywhere. And I mean everywhere. We tried to determine how many times does the logo appear on the bike, we found 50 of them but as it turned out we were eight short of the correct number according to the Indian guy (pun intended). Now before we swung our leg over the behemoth, we were informed that the bike weighs about 421kg, dry and that we should be careful with it. Surprisingly though, the moment you swing a leg over the bike your legs tends to snag in the armrest bars. Yes, armrests on a motorcycle! They are for the pillion only though. Let’s try again, swing your leg over the bike and when you sit on the exceptionally wide and comfortable leather perch, it feels like you are sitting in the bike rather than on it. The metre wide highway handlebars feel comfortable and the wide and exquisite rider seat feels even more so. The clocks are a similar sight albeit with a key difference of a 200W audio system which is also Bluetooth compatible. The switchgear is placed on chromed-out consoles the size of landline telephones placed on either side of the handlebars. Also, picking the bike off its stand is surprisingly easy. You would think that only Sylvester Stallone can do it but you would be wrong. Even Michael Cera will have little trouble getting the bike to run. And you don’t need a key to get going. Well, you need the fob in your pocket but you don’t need the actual key thanks to the key less start and to switch the ignition on all you need to do is press the power button on the tank. Switch the bike on and it wakes up with an extremely refined and relaxed V-twin rumble. Where the engine on a Harley feels raw and gruff the Thunderstroke 111 feels like it has been built by scientists with white lab coats and not engineers with grease in their fingernails. It idles like a purring kitten that has the power to punch through walls. Slot the gear lever into first and the gear slams home like a well-oiled jackhammer with a prominent thud. The moment you stop being stationary, at least a couple of quintals of the bike’s weight disappear almost instantaneously. It is hard to imagine how a motorcycle with this much mass, this much real estate and an 1800cc V-twin could be this easy to manage. The torque delivery is smoother than a baby’s bottom and there is ample torque available no matter where you are in the rev range. The gearshifts do require a bit of effort but you will never miss a gear or find false neutrals. The seat is as comfortable as comfortable can be and this relaxed demeanour is only enhanced by the massive footrests. All of this combined creates a riding experience like no other motorcycle. Especially on wide open roads it feels like you’re sitting in an armchair even though it’s the pillion who actually is. According to our photographer the pillion seat is akin to sitting in an S-class albeit on two wheels and exposed to the elements. The ride too is very forgiving and almost pliant. Most undulations are taken care of rather well thanks to the 46mm front forks and the adjustable air monoshock at the rear. I say almost pliant for where the smaller undulations and bumps pose little problem for the Roadmaster, the larger ones and especially pot holes do tend to be quite jarring. And when the bike gets even slightly unsettled with you on it, the heart immediately darts for the mouth. Braking duties are handled by ABS equipped twin 300mm discs up front and a similarly sized one at the rear, and they provide plenty of stopping power and feel. The true nature of the engine comes to the fore when you hit open roads. Even when revved to its limit there are no signs of strain from the motor as it offers torque effortlessly. The engine is virtually vibration free with dollops of its 139Nm of torque available throughout the rev range. ponds to the slightest of steering inputs and before you know it you’re leaning it into the corners without even a hint of retaliation or disobedience. And when you’re done with your mucking about you can simply switch on cruise control, sit back and have a drink (non-alcoholic of course!). No matter how you ride it, the Roadmaster stays planted. Even in traffic it is quite flickable and weaving through slow moving traffic is barely a problem. It is so easy to manage in fact that you can – I’m not making this up – make u-turns at 10kmph without putting your foot down. The only problem is that you might be the cause of an accident for the amount of heads this thing turns. It isn’t all hunky-dory though for the simple reason that the massive V-twin is – wait for it – air-cooled. Yes, which means if you get stuck in traffic you’ve pretty much had it. The best bet would be to park it on the side and wait. Also, operating the bling switchgear isn’t as easy because of the sheer size of the consoles. This means that you can’t reach all the buttons on the handlebars with your hands which can be a bit discomforting, especially when the music system starts blaring ‘Chikni Chameli’ instead of ‘Light my Fire’ in the middle of a crowded road. But despite that there is no taking away from the fact that the Roadmaster is a phenomenal motorcycle. It is comfortable, well-built, well-equipped (I know that’s a gross understatement), comes with lots of storage space and has probably the most refined engine on the market. Yes, the price is quite steep at Rs 38 lakh ex-showroom Delhi. But despite the sky-high price and engine that threatens to roast your legs in traffic, the Roadmaster is the best cruiser motorcycle out there and is the way a cruiser should be. And that’s saying something about a motorcycle which most bikers in the country probably won’t even get to see, but would kill to ride.